Did you know that home inspectors aren't required to be certified or insured to perform inspections? At IPO Properties, LLC, our goal is to be the best we can be. That's why we are certified and insured. We are recognized by the International Association of Certified Home Inspectors (InterNACHI), the world's largest organization of residential and commercial property inspectors. Count on us to provide you with the information you need to make the right residential real estate decisions in Powell and Dublin, OH. Call us today to discuss your home inspection needs. Our certified home inspector will inspect your home from top to bottom. Count on us for thorough inspections. Learn more about the standards IPO Properties adhere to while performing inspections. 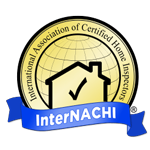 We are recognized by the International Association of Certified Home Inspectors (InterNACHI). Avoid surprises before you buy or sell your home. Contact us today to schedule a home inspection. Don't put your future investment in the wrong hands. Get in touch with the inspector at IPO Properties to learn more about your residential property. If you're searching for a home inspector who is professional, certified and insured, look no further. The experienced home inspector at IPO Properties has the skills and experience needed to perform an in-depth evaluation of your residential property. Call today to schedule your home inspection in Powell, OH and serving Dublin, Columbus, and the Central Ohio areas. As a first time home buyer, I am glad that I had Ward for the home inspection. He is very knowledgeable and reliable. I liked that as he was doing the home inspection, he took the time to answer any questions I had and explained them in detail. He was very thorough in the home inspection.